Dodie isn’t really a dessert person. Chocolate cake? She won’t eat more than a forkful, if any at all. She’s more of a savory gal who’s been known to crack salt grains on restaurant tables and finger-lick the briny powder. But I had not yet watched her “A Little Over 100 Facts” video on YouTube, which is why — at my suggestion — Dodie (and her friend Hannah and her publicist and three other companions) and I found ourselves at a Dylan’s Candy Bar in lower Manhattan surrounded by every single sweet imaginable. Her Dylan’s bag sat between us, bits of chocolate treats and gummy candies peeking through the cellophane. I was a little confused and so was Ellie Mitchell, one of Dodie’s 2.69+ million YouTube subscribers, who upon watching the “100 Facts” video noted, “well you enjoyed those ‘cakes’ you made with hazel﻿” in the comment section (referring to Dodie’s Valentine’s Day baking video from two years ago). And so because I’m actually sitting here with Dodie in person and because I’m interviewing her, I follow Ellie’s lead: “You said you don’t like gummy candies, but…” I gesture to the bag. 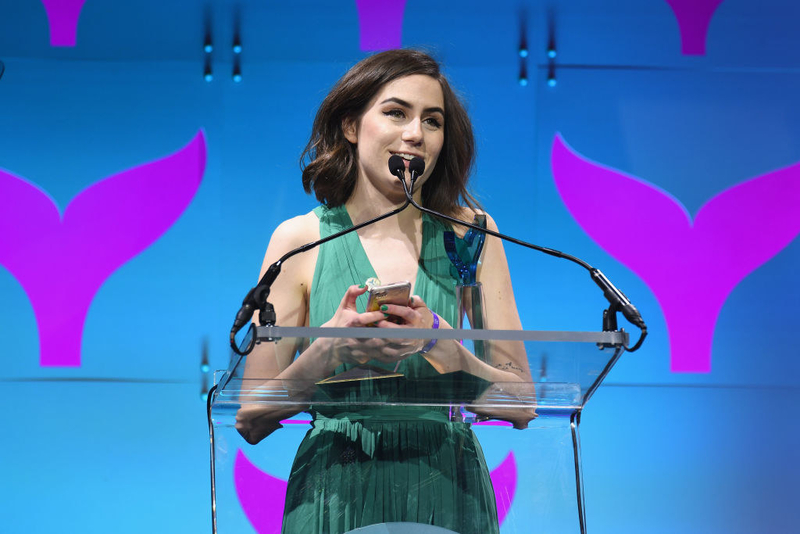 Dodie accepts an award for Best YouTube Musician on stage at the the 9th Annual Shorty Awards on April 23, 2017, in New York City. A bold move on Dodie’s part, considering how cancel culture is at an all-time high; these days it’s safer to share sanitized highlights and delete any regrets and controversies that can later be used as weapons to destroy the very image you created. But Dodie’s more drawn to speaking and singing about her lowlights, and in validating the moments that usually don’t make it to our daily feeds, she’s become an inspiration for others who are trying to do the same. Her latest project Human, a self-released EP, features the title track, which she originally debuted on her YouTube channel in 2016, along with six other original songs that untangle universal discomforts like crushes, self-doubt, and loneliness, topics that especially resonate with young adults — which makes sense, given the songwriter started on this path when she was only 15. Dodie’s music falls in the same vein as Ingrid Michaelson, Regina Spektor, and Kate Nash, singer-songwriters whose lyrics take center stage amid light production, conveying feelings that are borderline cringeworthy in their poignancy, but also all-embracing and comforting in their transparent vulnerability. Each of her EP debuts has topped the last, with her third and most recent, Human, peaking at No. 5 on the UK Album Chart, No. 2 on the US Americana/Folk Album Chart, and No. 82 on the Billboard 200. And this fall, she kicks off her second US tour, stopping at 22 cities. All of this achieved with little to no press. YouTube is full of talented singer-songwriters and vloggers, but only a select few have successfully converted their online followings and viral moments into established recording careers like those of the chart-topping artists whose songs they cover. Dodie is one of those few. Earlier that week, a line of 250+ people snaked its way through the lofty, industrial bowels of Rough Trade, a Brooklyn concert venue where Dodie had just performed to a sold-out audience. The demographic ranged from preteen to mid-twentysomethings — parent chaperones excluded — with teens dominating the group, all of them eager to meet and greet the singer. A feverish shriek rang from a trio of fans in the queue, signaling Dodie’s entrance. She wore a nondescript, short-sleeved black midi dress, her usual half-and-half hairdo; if you didn’t know her by face, she could have stepped right into her own meet-and-greet line and wouldn’t have looked an inch out of place. Maddy, a 21-year-old singer-songwriter who discovered Dodie back in 2010, also found what she described as “a quiet validation within myself” through the song. Maddy didn’t identify as queer until later in life, but Dodie’s music helped her feel “really normal” throughout that journey. “It was like I had this secret with her in my head,” she told me. As I left the event, the line for Dodie still hugged the outside of the building, so the next day I ask her how it was. “It was very long,” she replies. “It was so long, but I think it’s a really good refresh.” The candy’s given her a temporary high, but her exhaustion from a long night and a longer day full of press interviews and in-office performances is still very much a thing. “You’re like, Why am I doing this? I’m so stressed and tired,” she tells me. “Then you’ll meet every single person and get a personal thank you. It’s such a typical phrase, but puts it into perspective. I’m like oh, yeah. These are real people.” Still, Dodie thinks it’s unnatural to rush that kind of connection, and after all of the meet-and-greets she’s done, has concluded that less is more and decided to prioritize quality over quantity. She’s found that meeting 100 people a day maximum is her limit, striking a good balance between meeting as many people as possible while also ensuring both she and her fans both have enough time to make a genuine connection. But wait! There were at least twice as many people at last night’s meet-and-greet. Either Dodie hasn’t enforced the boundaries she’s set for her own well-being or she’s stepping outside of her comfort zone and challenging herself to push past her self-imposed limits, as she has with her music. The music video for “Monster” from Dodie’s latest EP Human. Take her songwriting, for example. She used to think the only way to write was to get overwhelmed by emotions and let it pour out of her, a process that worked when she had more time on her hands. But when she ventured further into the professional music industry, Dodie found herself in structured writing sessions, which she described as horrible, and was cynical about the “manufactured” vibe of it all. She eventually found a middle ground where she still writes by herself while also incorporating the more structured elements of songwriting, like brainstorming ideas and themes beforehand and adding hooks. “I still definitely get the songs that pour out of me,” she says. “But I think in learning to work with other people and sharing your creativity, it just kinda teaches you that there’s no one way to write and to open up your mind, try new things, and challenge yourself, because something will come out of it.” Going on tour and producing her music have also taught her how to amplify her vocals — adding string instruments and harmonies, or “voices around [her] voice” — without losing the self-described “small, intimate” aesthetic that she crafted in her bedroom YouTube sessions. I ask Dodie if there’s anything she wants her fans to know about the next phase of her career, and that’s when she, someone whose career is based on conversation and storytelling and jumpcuts, goes silent for about 30 seconds — an eternity on YouTube. Then she says: “I don’t really know what I’m doing. I’m just kinda going with the flow. I think… I don’t know, I’m finding out more of what I like. And I think… I don’t know. I feel like people are still joining me. I’m so terrified of if my opinion and personal… What’s the word? I don’t know… If the way I want to make music changes and then that doesn’t match my audience, I’d feel bad. I don’t know. I’m still finding my feet pretty much. I’m still kind of working through it.” And so Dodie doesn’t know. But how many young adults (or hell, even older adults) can confidently say what they’ll be doing in the next phase of their life? Sometimes it’s hard to remember that Dodie doesn’t have all the answers — that her content, as relatable and honest and charming as it is, is still edited and produced. There are in-between pauses, “I don’t know”s, and many other things we’ll never know or see. Dodie has to go back to the UK tonight, so she and her friend Hannah and her publicist thank me and hug me and rush out of the lobby into the frigid January night. After they leave, I check out her Instagram, curious to see how our day will look through Dodie’s lens. Her Instagram story shows a brief clip of her marveling at the extravagance that is Dylan’s Candy Bar followed by a montage of her and Hannah running around JFK Airport desperately searching for a Starbucks. She’s filmed all of this chin-up, Blair Witch Project-style, her signature top knot flopping about. There’s also a clip of her retelling the same candy anecdote she told me at the candy store — about the time she ate way too many Warheads, making her tongue bleed and (probably?) damaging her tastebuds and sparking her love for salt. As a journalist, I can’t help but feel some kinda way about her sharing that quirky anecdote with her viewers and not saving it for my own story; I had assumed I’d be getting a different version of Dodie than the one we see behind a screen, but maybe it is possible for a celebrity to be authentic and consistent in their persona both online and off.